Bought from Hotspur in 1966. 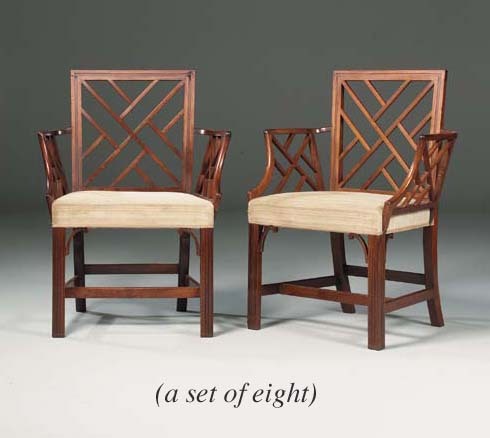 These chairs, with their interlaced diagonal patterned splats, follow the design of 'Chinese Double Brac'd Paleing' in William Halfpenny's Twenty New Designs of Chinese Lattice, London, 1750. Related chair back patterns feature in Chippendale's The Gentleman and Cabinet Maker's Director, London 1st ed., 1754. While Chippendale noted that such chairs were particularly appropriate for Chinese Temples, he also mentions that 'Designs of chairs after the Chinese manner... are very proper for a lady's Dressing Room, especially if hung with India (Chinese) paper'. Three pairs of elaborately embellished walnut side chairs, with this splat design, were supplied to Edward Weld Esq., Lulworth Castle, and sold by family descent, in these Rooms, 5 December 1991, lots 232-234. A set of five pagoda-topped mahogany armchairs, with the same splat and arm design as the present lot, were sold by Lord Hastings, removed from Melton Constable, Norfolk, Sotheby's London, 17 March 1950, lot 110.